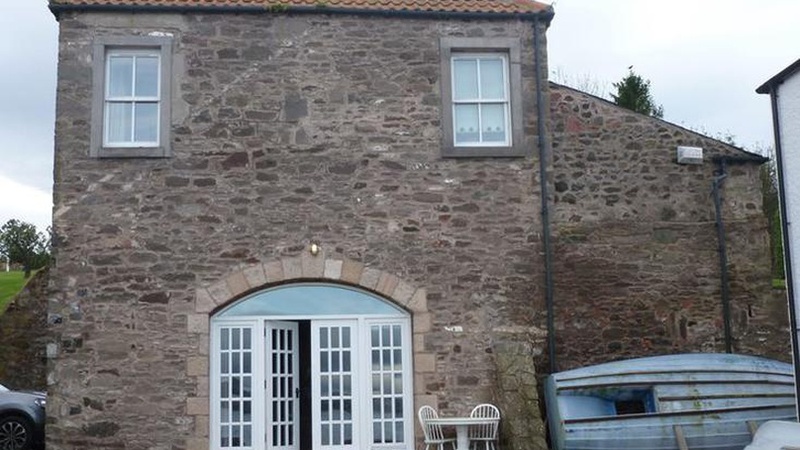 The Ice Barn, previously let as a holiday cottage, has been awarded four stars by the Scottish Tourist Board and is now available as a potential long-term let. This presents a rare opportunity to live in a charming property in the coastal village of Balmerino with the most spectacular views across the River Tay; an opportunity many could not afford on a mortgage. The Ice Barn was originally used in the 19th century by Balmerino's local fisherman to store ice for their catches throughout the year as its thick stone walls prevented the ice from melting in the spring. Today this keeps the house wonderfully warm in the winter and nice and cool in the summer. Many of the beautiful original features were maintained during the conversion including the high barrelled ceiling in the kitchen and the pan-tiled roof. The wonderfully spacious and bright sitting room has a beamed ceiling and arched picture windows which take full advantage of the house's prime location whilst you remain warm and dry in front of the wood burning stove. The accommodation consists of two delightful double bedrooms, each with en-suite bathrooms, one twin bedroom with a separate bathroom and one smaller single room ideal as a study or children's room. The kitchen is large and well equipped with an AGA cooker which helps create a cosy and socialable space as the heart of the house. Shirley Kenyon, Head of Lettings at CKD Galbraith, said; "The Ice Barn is in a truly stunning and tranquil setting with fantastic riverside views. It's has been used as an extremely popular holiday let in the past and is now available to let as a wonderful family home. "Balmerino is a picturesque coastal village along the north coast of Fife and is an official conservation area. There are a number of coastal walks easily accessed from The Ice Barn and a pathway along the river bank will lead you to what the area is best known for, it's beautiful Abbey. This is where Mary Queen of Scots is thought to have spent time on her journeys to St Andrews. "Balmerino is ideally located for enjoying all the outdoor activities the region has to offer such as walking, fishing, cycling, horse riding, and with over 40 golf courses and being only a short drive from St Andrew's Old Course, you will be spoilt for choice. "The busy and bustling cities of Perth and Dundee are both less than 45 minutes' drive from The Ice Barn offering all the amenities and facilities you could desire. Edinburgh airport is just over one hours' drive to the south and the regional airport at Dundee offers a good selection of short haul flights." The Ice Barn is available to let for 1,100 per month. For further information please contact CKD Galbraith's Perth office on tel: 01738 456096.